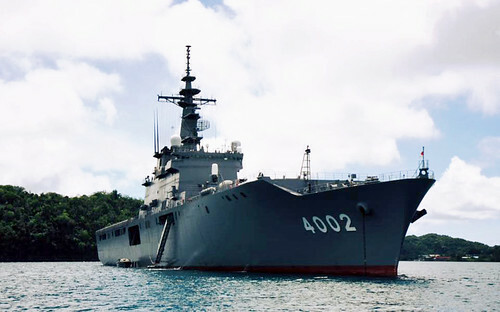 The Japan Maritime Self-Defense Force's JS Shimokita (LST 4002) sits at anchor off Koror during Pacific Partnership 2016. KOROR, Palau - Pacific Partnership 2016 arrived in Palau, Aug. 4, aboard JS Shimokita (LST 4002), making this the second year Pacific Partnership has visited Palau since the mission began in 2006. The Pacific Partnership team, made up of service members and civilians from Japan, Australia, the United Kingdom and the United States, will work with civilian and military leadership to conduct cooperative health engagements, subject matter expert exchanges in nursing and pharmacy, and civil-engineering projects, all focused on improving partner nations' collective ability to respond to a variety of natural disasters. The Japan Maritime Self-Defense Force worked closely with the government of Palau to plan a range of medical and engineering initiatives designed to promote cooperation and knowledge exchange between local authorities and the multinational Pacific Partnership team. The visit to Palau is part of the wider Pacific Partnership 2016 mission, building cooperation between allied and partner nations. "This is the first time a Japanese naval vessel has visited Palau, and it's an honor for the Japanese to lead the Pacific Partnership mission in Palau, and to work with the government and people here," said Capt. Takeshi Okada, commander, Landing Ship Division One, embarked aboard Shimokita. While Shimokita is in Palau, USNS Mercy (T-AH 19) and the rest of the Pacific Partnership 2016 team will make mission stops in Malaysia and Indonesia. Pacific Partnership 2016 is focused on enhancing relationships and multinational interoperability through knowledge exchange and cooperative training, ensuring partner nations are prepared to collectively and effectively respond when disaster strikes. Pacific Partnership is the largest annual multilateral humanitarian assistance and disaster relief preparedness mission conducted in the Indo-Asia-Pacific.